Cover Art: I like the simple approach to the cover, with Nolan looking over the wall of his fort (aka his body), watching the germs approach. There are also illustrations in the book in the same style as the cover. When I look at children’s books covers, different things catch my eye compared to books aimed at older readers. I look for simple covers that don’t draw that many questions to it. Can you imagine if there were 100 different items on the cover? How many nights would it take to get started reading the book because the child is too busy asking: What’s that? Why is that there? How many flowers are on the cover? Why isn’t there a dog? 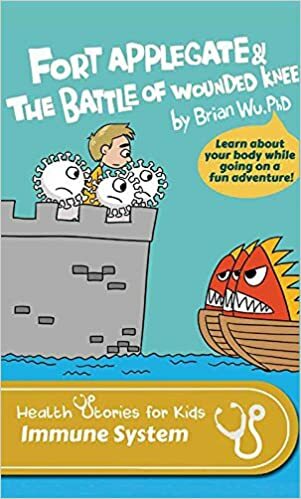 My Thoughts: This book is aimed at young kids to help them learn about how the body fights infections. I found it cute and chuckled in a few spots while remembering what I did as a child. Before the story begins, there is a section for parents giving tips to make sure your child’s immune system remains strong. These tips are good for everyone, not just kids. While reading this story, I remembered what I told my mom when she was going through chemotherapy: A battle is going on inside your body and the chemo is there to help stomp out those icky cancer cells. Squish, squish, squish. Notes: I think it would be nice if the author wrote a book like this about going through cancer treatment, but for adults. Even though it would be written at a child’s level, I think adults would chuckle. And we all know how laughter is great medicine. The book could also help adults explain to a child what’s going on in the body during treatment.